My mom, brother, sister in law, sister and her fiance all came over to the house today for an impromptu lunch. 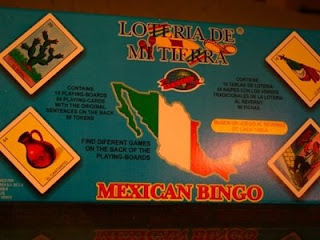 We had a really fun time eating pizza, hanging out and playing “Mexican Bingo”, a Christmas gift I received from Cali and Will. And, if the game alone wasn’t funny enough already... the bingo cards inside were funnier. Ummm.... yeah, so I know I’m definitely not fluent (yet) in Espanol... but, I’m pretty good with pictures. Looks like El Borracho is the "town drunk". Never would you see that on bingo cards in the US.